Our fall is moving along nicely here in the SHIFT-IT Coach, Inc office. We are hunkered down focused on the launch of our fall programs and readying for the winter programs just around the bend. Our Office Manager, Stasi Manser was gone all last week on an exciting cross-continent trip across to Rhode Island, U.S.A.
She attended The Phoenix Society's World Burn Conference and is still buzzing with all the amazing people she met, things she learned and inspirations she came away with. Stasi is a burn survivor from a kitchen accident when she was 5. This is the first time she connected with so many fellow thrivers who've shared a similar journey (over 900 attended from across the globe). Here's an inspirational article from one of the survivors of the Providence nightclub fire --- love finds a way! So many SHIFT-IT stories all around us ... you are an inspiration Stasi, keep rocking! 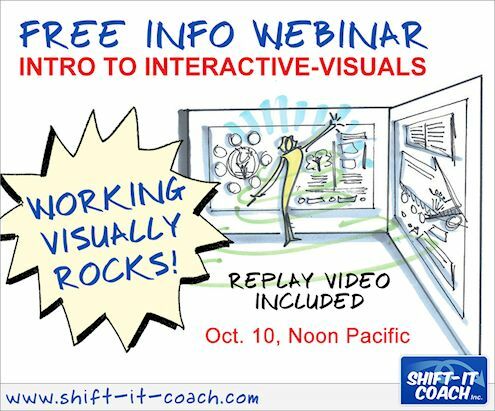 Last week we had a special 90-Minute, Info Webinar --- Intro to Interactive-Visuals with over 200 registrants. No worries if you missed it. Just register here for instant access to the Replay Video. Thanks for the excellent questions ... 45 minutes of Bonus Q&A included plus my visual presentation notes. "Taking the Fundamentals of Interactive-Visuals was such a positive experience that FAR exceeded my expectations. The workshop was motivating, inspiring, educational and fun. Christina creates a wonderfully supportive learning environment and guides participants through a carefully crafted curriculum designed to get participants actively using visuals right way. I left the workshop with new confidence and applied my visual skills at work immediately. Christina very generously shares her knowledge, experience and passion. I can't wait to take another course with her. An added bonus was the wonderful people from all over that I met. I highly recommend this training to anyone considering it. Go for it!" Just 1 Spot Left - We Start on Monday! Serious about up-leveling your visual skills and career? Learn and bond with unique Process Professionals from across the globe ... who unite in a shared mission to effectively use Interactive-Visuals with groups and individuals. 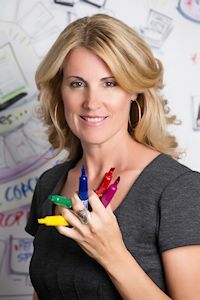 Develop your brand, signature style, visual tools, graphic competencies and overall confidence in your use of productive visual techniques, whether you are internal in an organization or have an independent practice, business or content area. For coaches, therapists and other Process Professionals who work with individuals, couples or personal growth groups. This one-of-a-kind experience teaches you how to work visually with your clients and licenses you in our SHIFT-IT System® (17 visual maps as complete process or piecemeal). Join our amazing international cohort of Certified Visual Coaches® and add the power of Visual Coaching to your own practice. Exploratory Chat with Christina to discuss your goals and determine which package best for you. Email [email protected] to book. Note: This article is the third in a 3-part series. The first article explained how Authors, Speakers and Trainers can use Interactive-Visuals to better their work. The second article explained how Organizational Leaders, Consultants and Facilitators most commonly use the visual approach. And this final article, explains how Interactive-Visuals are used effectively in coaching, therapy, counseling and other personal development work (a topic close to my heart). custom chart work, visual scribing / recording (i.e. 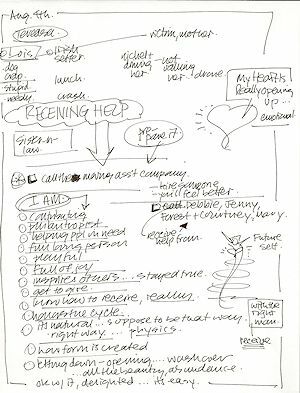 graphic recording), visual facilitation (sometimes called graphic facilitation) and visual coaching (sometimes called graphic coaching). Depending on the nature of your Process Practice you may use one, several, or all of the approaches. I have covered these four applications in another article (and here's a 90-Minute Info Webinar where I thoroughly cover them) so I won't duplicate myself again here. Rather, in this new series of articles, I'll explain which types of professionals tend to use which applications and why. (if you aren't familiar with the four ways of working, you'll want to read that article or watch the webinar first). Interactive-Visuals can effectively be applied wherever there is some sort of process going on with a client (be they groups or individuals) - given it's the kind of process that lends itself to being visible (i.e. drawn out and seen --- either by the client themselves or possibly others if they care for their info to be shared). Coaches, therapists and other Helping Professionals have many different types of processes - used with individuals (and occasionally they may pool those individuals into groups). Just like consultants, facilitators, trainers and authors --- coaches, therapists and other helping professionals can vary on the types of process and topics that they focus on with their clients. There are MANY different types of coaches (life coaches, executive coaches, entrepreneurial/start up coaches, writing coaches, financial coaches, weight/body coaches, etc), just as they are MANY different types of therapists and counselors (family therapists, couples therapists, eating disorders, family-of-origin, co-dependency/power, recovery/addictions, cognitive, transpersonal etc.). And there are MANY other different types of professionals who work with individuals in a myriad of ways (financial planners, accountants, nutritionists, disability advocates, spiritual counselors, tarot readers, numerologists, astrologists, etc). And most, if not all, of these various process workers can benefit from integrating visual technology into their professional toolkit. 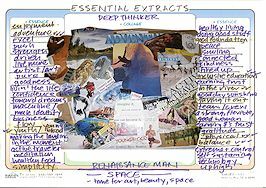 Just like their counterparts who do group work in corporations, not-for-profits, and government arenas - coaches, therapists and the other types of counselors can find it beneficial to create visual artifacts (handouts, postcards, posters, murals, explainer videos, etc) to help communicate key concepts to their clients. For example, in my own coaching practice, I have a signature process (called The SHIFT-IT Visual Coaching Process). I've developed a visual model that allows me to explain this process easily to my clients. I also have some large displays that explain my journey with Visual Coaching. And I have created a Visual Bio that explains my background overall (which I use on my sites and in my workshops). I also have developed some visual postcards that I use (especially in social media) to highlight certain key concepts, phrases and philosophical points about the way I work. Not all visuals that you might use as a coach or therapist need to be shared or to be particularly 'pretty' - some can just be for your own private use. Many of us, in the course of our work, take notes on our client sessions to remind us of key milestones, events, thoughts, etc. Learning how to work visually allows us to take more interesting notes for ourselves and to better highlight the things our clients say. In process work with individuals, sometimes it's appropriate to create summaries of what clients are saying --- to just follow along behind them as they are speaking and record what they are saying. 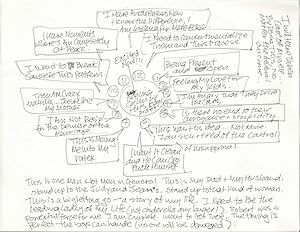 This kind of work is technically called 'visual or graphic recording' (again, see the 4 Main Ways of Working article). For example, in coaching and therapy work, clients often share stories. Instead of interrupting them and facilitating their process, we follow along beside and visually record what they are saying (synthesizing the exact words they are saying into sound bites and drawing appropriate, accompanying imagery). 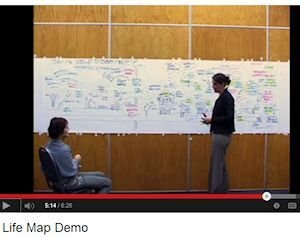 These visual recordings can be created via large wall-size displays (like you see in this video). Or, increasingly, they are created on smaller sheets of paper or via digital tablet. 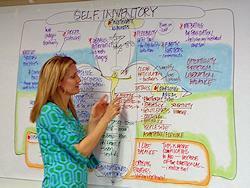 This provides a visual record of the client's story, for them and those they care to share it with. 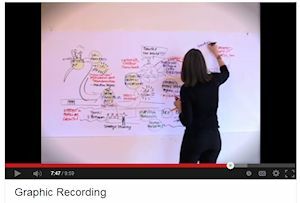 Note: in the video I am performing 'graphic recording' using an audio of the story of my visual career. While all of the visual methods I have already listed are powerful, it's my opinion that "co-built" displays are THE most powerful way to engage clients ... this way of working puts the 'interactive' in Interactive-Visuals. This is visual work with individuals at its finest. The catch-all term I use for this is "Visual Coaching" (again, see the 4 Main Ways of Working Visually article). Although this could be called Visual Therapy, Visual Counseling, Visual Financial Planning, etc. depending on the nature of process work you are doing and your role/title. Unlike the Visual Recording mentioned before, in Visual Coaching you DO more strongly facilitate, lead and guide the process - not merely following along. You create a process container to hold your client in and the visual display mirrors that container back to your client, helping them literally SEE what they mean, think and feel in powerful ways. I couldn't write an article about the role of visuals in coaching, therapy and other process work with individuals, without mentioning the potential for the development of custom templates and signature systems. The creation of visual templates is a natural for Process Workers who have favorite exercises or experiences that they tend to do with many of their clients. Sometimes, like in the case of my SHIFT-IT System® these exercises may combine to form an integrated, overall process - a signature system. A wonderful way to brand your unique intellectual property. 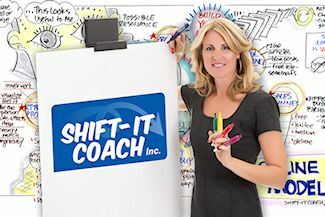 Note: After years of just using my SHIFT-IT System® within my own practice, I now license other Process Professionals in my 17 visual coaching maps via Visual Coach Certification®. Finally, another beauty of working in the visual way with coaching and therapy clients is the lovely takeaway materials you can offer. All of the various methods I have explained lend themselves so nicely to creating special summaries, booklets and reports for your clients. These materials can be basic and functional (i.e. emailed pdfs) or they can be much more elaborate (i.e. bound, full color coffee table books). It just depends on the type of offering you wish to provide. In closing, I hope you have found this article (and the fuller series) interesting, educational and inspiring. As I have hoped to show you, the world of Interactive-Visuals for the Process Professional is varied, rich and deeply rewarding. I wish you all the best in integrating visuals effectively into your own practice. Intrigued by the visual way of working?! Want to learn how to apply this powerful methodology to your own work with groups and/or individuals? Our Fundamentals of Interactive-Visuals workshop provides a thorough training on the basics for all four genres of the work (Custom Chart Work, Visual Recording, Visual Facilitation and Visual Coaching). Offered online in the Fall and In-Person in Victoria, British Columbia, Canada in the Spring. Private Trainings and In-House Workshops are also available. Not a beginner - i.e. already have taken Fundamentals of Interactive-Visuals (or have equivalent experience)? If so, see our advanced programs: Magic Marker Mastermind, Visual Coach Certification and Private Apprenticeships.